I have to say that I am not surprised that the Chicago Bears decided to fire Lovie Smith after the second late-season collapse by the team that lead the division the first half of the year. I also agree with the decision, mostly. During the entire tenure of Lovie Smith, the Bears' offense has been incompetant. Lovie is a great defensive mind, but I'm just not sold on his ability as a head coach. And judging by the fact that no other teams hired him, I guess I'm not the only one who had doubts. The Bears went through several offensive coordinators during Smith's time, including the revolutionary mind of Mike Martz, but the team's offense remained abysmal throughout. 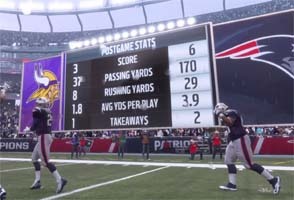 They changed quarterbacks, changed offensive linemen, changed running backs, and rotated through a number of receivers. They even changed stadiums. The only constant was Smith. The firing of Lovie Smith just further expands my concerns with the Bears' defense. 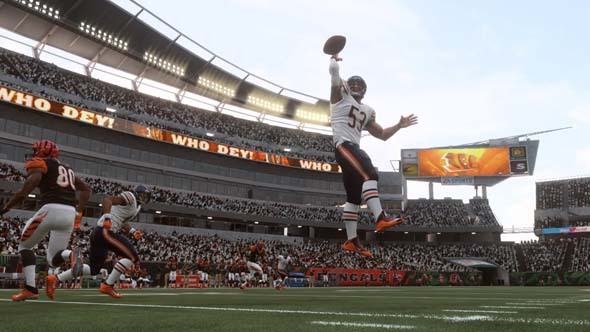 I've already expressed fear that the defense is getting old and that veterans like Brian Urlacher, Lance Briggs, and Charles Tillman just might not have much left in their tanks. The window is definitely closing for these players, and they can't afford to wait around for several "rebuilding" years in order to become championship contenders again. 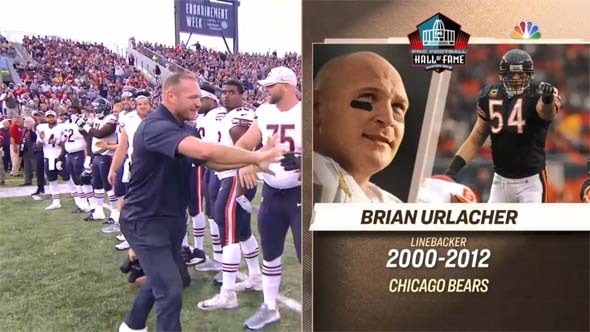 I want to see Brian Urlacher win a SuperBowl with the Chicago Bears, but if the team's new coaching staff isn't able to fix Chicago's offensive woes, while maintaining strength on defense, then it doesn't look like Urlacher will get that ring. At least, not with the Bears. New Chicago Bears head coach, Marc Trestman. Bears' 2012 season collapses again. Did they deserve it? At the start of the 2012 season, I may have had my hopes for the Bears a little high. 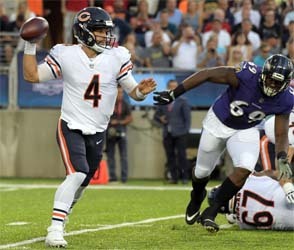 I argued that the Bears might be the most balanced team in the league this year, potentially featuring an elite offense, defense, and special teams! For the first half of the season, in which the Bears got off to a 7-1 start, it looked like I might have been right. But red flags started going up out of the gate. 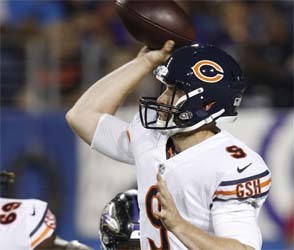 The offensive line just wasn't protecting Cutler very well, and Mike Tice's offense too often looked like the anemic offenses under coordinator Mike Martz. 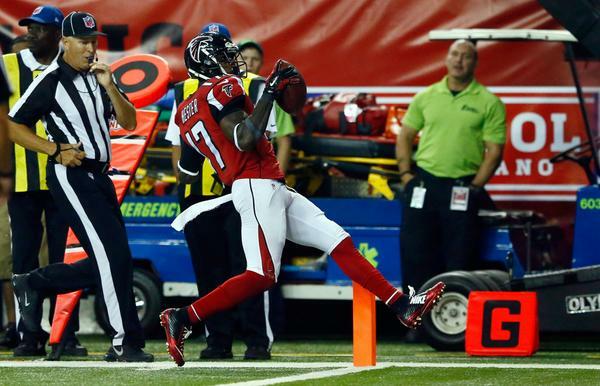 Although not ruled out for sure, it didn't look like Johnny Knox would be playing this year, and Devin Hester just doesn't have the same spark he once had. Early in the season, it seemed as if the Bears might have to rely once again on their defense. That defense shocked the league by being more effective than the offense, with both cornerbacks (Tim Jennings and Charles Tillman) earning Pro-Bowl honors for forcing turnovers and scoring touchdowns! Things were looking good at 7-1, but there was a bad feeling in my gut that this all looked too familiar. Starting the second half of the season, that feeling became justified. Once again, the injury bug started biting the Bears. Alshon Jeffrey and Earl Bennett were both the victims of multi-week injuries, leaving Brandon Marshall as the team's only true threat in the passing game and allowing opposing defenses to send everything they had after Jay Cutler and Matt Forte. 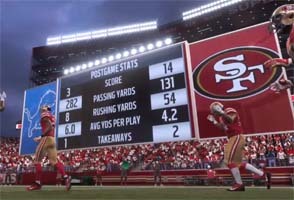 Cutler and Forte also suffered temporary injuries, and backups Jason Campbell and Micheal Bush were ineffective against the 49ers. I'm getting too used to seeing Urlacher in street clothes.